Mary Kate takes a service-first approach to representing clients in complex healthcare disputes in federal and state courts. Mary Kate is involved in every stage of commercial and healthcare litigation, from initial analysis of disputes to final resolution of matters on appeal. She advises and defends providers, hospitals, practitioners, suppliers and executives in business-critical claims and decisions. Mary Kate brings a bevy of skills to her advocacy for clients. Her approachable, unassuming demeanor allows for easy collaboration among clients, witnesses and counsel. 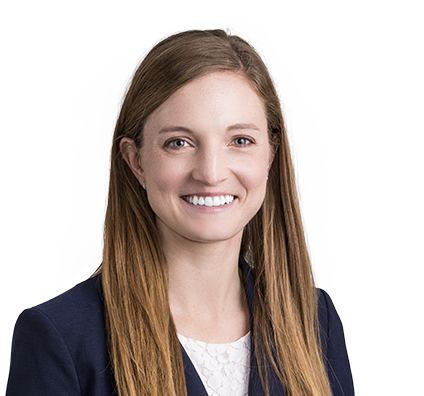 She is also a skilled writer, bringing injunctive and other extraordinary relief for clients through well-written motions and compelling briefs. Her astute analysis of case law and investigative drive lead to creative strategies and solutions. Mary Kate is admittedly competitive on behalf of clients, which shines in trial. She recently secured a defense verdict in a high-profile Federal Employers' Liability Act (FELA) jury trial. Mary Kate is a proud supporter of all things St. Louis. She is especially drawn to the arts and theater scene. Mary Kate formerly worked at The Muny outdoor musical theater – a St. Louis treasure – and frequently attends live performances around town. She and her husband actively support local businesses and restaurants and are contributing members to the Missouri Botanical Gardens. She also enjoys reading historical fiction and hitting the gym. Mary Kate has an active pro bono practice. She represents low-income families, victims of domestic violence and indigent clients through the firm’s relationship with Grace Hill Settlement House.